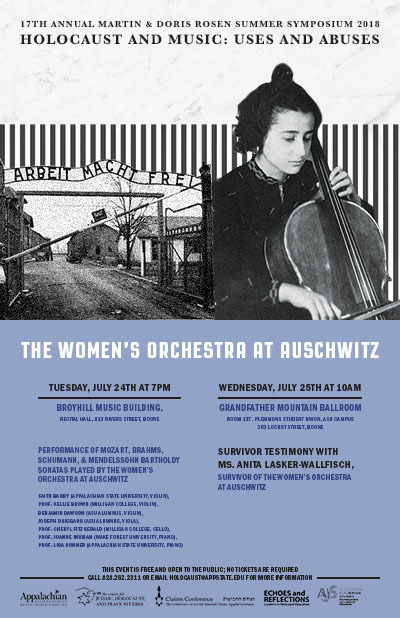 Appalachian State University’s Center for Judaic, Holocaust, and Peace Studies invites the public to a presentation by Anita Lasker-Wallfisch (London, England), one of the few remaining survivors of the Women’s Orchestra at Auschwitz. Her talk will take place at Grandfather Mountain Ballroom, Room 137, in ASU’s Plemmons Student Union (263 Locust Street) on Wednesday, July 25. The talk will begin at 10:00 am. Her testimony will be preceded by an evening performance of sonatas by W. A. Mozart, F. Schumann, and J. Brahms the SS forced the orchestra to perform as well as pieces by Jewish composers the women played as an act of spiritual resistance. Performed by faculty and students from the Hayes School of Music, Milligan College and Wake Forest University, the event will take place at the Recital Hall of the Broyhill Music Center (813 Rivers Street, on the ASU campus) on Tuesday, July 24, beginning at 7:00 pm. Born into an acculturated Jewish middle-class family in Breslau, Germany, Anita Lasker-Wallfisch grew up in a home filled with music. Her mother, a violinist, encouraged her three daughters to play an instrument. Anita Lasker-Wallfisch opted for the cello. She was seven years old, when Hitler was brought to power. Her parents initially hesitated to leave Germany. The nationwide pogroms known as Kristallnacht in November 1938 prompted the Laskers to try to escape the country. Faced with major obstacles, they managed to send their daughter Marianne to England, but were unsuccessful in their attempts to emigrate with their remaining two daughters. In early 1942, the Nazi regime deported Anita Lasker-Wallfisch’s parents to the East, leaving her and her sister to fight for themselves. When the two young women tried to escape to Paris in the fall of 1942, the Gestapo arrested them. Separated from her sister, Lasker-Wallfisch was deported to Auschwitz in December of 1943. In the quarantine block in Auschwitz-Birkenau, she mentioned to a female prisoner that she played the cello. Quickly introduced to Alma Rosé, the conductor of the women’s orchestra, she was transferred to the music barracks. As an orchestra member, she had a status of relative “privilege,” which also enabled her to save her sister from death in the gas chambers. The orchestra was forced to play by the camp’s gate, give Sunday concerts, and even play privately for the SS. When the Red Army approached the camp, Anita Lasker-Wallfisch and her sister were deported to Bergen Belsen in the center of the Reich. In mid-April, Belsen was liberated by British troops. After liberation, the three sisters were eventually reunited in the UK, where Lasker-Wallfisch became a founding member of the English Chamber Orchestra.